One of China’s most senior former military officers hoarded more than a ton of cash and precious jade in his basement, a Hong Kong magazine reported on Thursday, the latest details to emerge from the high-profile case amid Beijing’s war on graft. 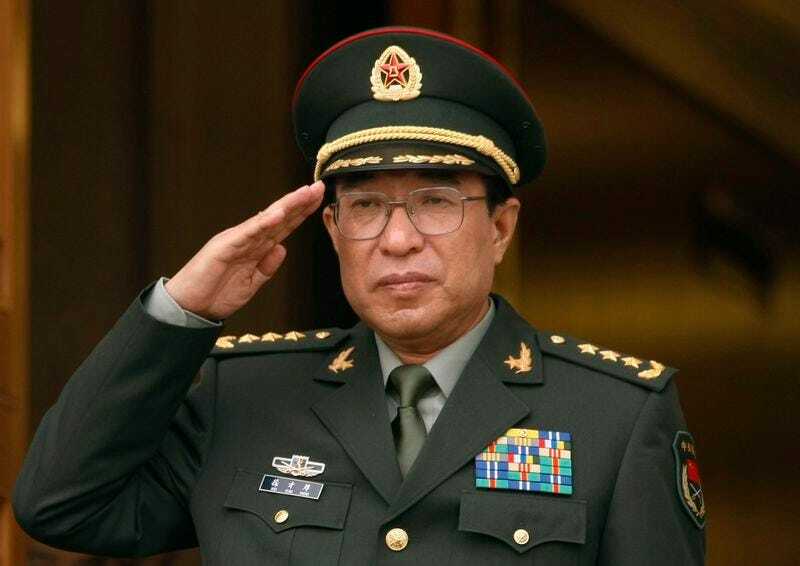 Military prosecutors have said that Xu Caihou, a former vice chairman of the powerful Central Military Commission, had confessed to taking “massive” bribes in exchange for help in promotions. Officials say Xu, who retired as vice chairman last year and from the ruling Communist Party’s decision-making Politburo in 2012, will likely face a court martial now that an investigation has been finished. In March, prosecutors searched Xu’s luxury home in Beijing and discovered stashed in the basement “more than a ton” of U.S. dollars, euros and Chinese yuan, reported Phoenix Weekly, a magazine run by Hong Kong broadcaster Phoenix Television. Xu had also stored countless precious gems and hundreds of kilograms of expensive jade, as well as rare antiques, the magazine said, citing a person with knowledge of the matter who is close to high levels of the military. “Case handlers had no option but to call more than 10 military trucks before all the confiscated property piled up like mountains from this former Central Military Commission vice chairman’s house could be taken away,” the magazine said. The report, which was carried by several mainland China news outlets, added that Xu was forced to “bow his head and admit defeat” when confronted with a list of the items. President Xi Jinping heads the Central Military Commission, which controls the 2.3 million-strong armed forces, the world’s largest, and has repeatedly reminded them to be loyal to the party. He has made weeding out corruption in the military a top goal as he steps up efforts to modernize forces that are increasingly projecting power. Xu, whose graft probe was announced in June, has been stripped of his title and expelled from the military and the party. China cracked down on corruption in the military in the late 1990s, banning it from engaging in business. But the military has been involved in commercial dealings in recent years due to a lack of checks and balances, analysts have said. Anti-graft advocates have said corruption in the military is so pervasive that it could undermine China’s ability to wage war.